Want to be a Model - FFF Week (TM) has an event just for you! Have you ever seen a live fashion show, watched a fashion show on TV or flipped through a magazine and said to yourself: "I wish I could do that"? Well the good news is chances are you CAN do it! Whether you are a new model just starting out or you are a few years into your career, you will benefit from our "Aspiring Model Panel Discussion". 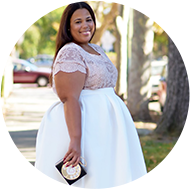 Learn the Secrets to starting a career as a plus sized model from the ground floor up and/or how to take your career to the "next level"…. from people who are making it happen as we speak! Sharon Quinn, The ORIGINAL Runway Diva (Plus Model/Singer/Actress/Writer) Star of Mo'Nique's FAT Chance, MTV's MADE, Cash Cab & Throwdown With Bobby Flay and most recently seen on The Style Network's "Ruby"; will be on hand to host and moderate the panel discussion. IF you are even thinking of starting a career as a plus sized model, THIS is the seminar that you DO NOT want to miss! More information on this event can be found at http://www.fffweek.com/. Sorry Makeup Vixen for not posting the link...the link is www.fffweek.com I also posted it on the actual post.